Last year, one of the first posts on Blonde Art Books featured a hand-made book by Berlin based artist Diana Artus titled Those aren’t your memories, they’re somebody else’s (2011). The leporello, featuring her photographic series of the same name, is still one of the most beautiful artist books we have worked with. Over the last year, we were pleased to see two more books published by the artist. 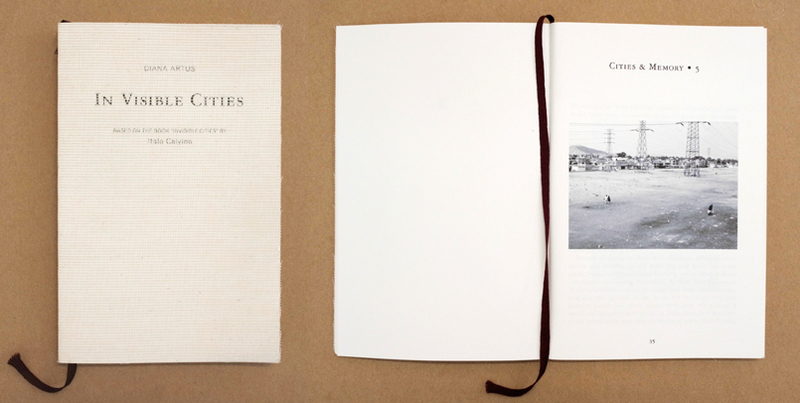 One titled In Visible Cities, is Artus’ first perfectly bound book. Since first seeing the book, we new it was a very special project and we were lucky enough to have had a hand-made mock-up of In Visible Cities on display at the bookstore in anticipation of the production of a larger edition. Earlier this summer, In Visible Cities was published by Plan Bey (Beirut) in cooperation with Berlin Beirut Multiples, and now the book is available for purchase through Blonde Art Books. For the occasion of the publication of the first edition of In Visible Cities, Blonde Art Books spoke with Artus about her photographic strategies and connections to the original Calvino text, and her experience working with an independent publisher to produce the book. 143 pages, Soft Cover binding with special mesh cover in pergamin bag. Published by Plan Bey (Beirut) in cooperation with Berlin Beirut Multiples. Limited edition of 300 copies, signed by the artist. Blonde Art Books: Books have been part of your practice for sometime, what are your thoughts about yourself as a photographer and book-maker? Diana Artus: In general I prefer to work with small sizes when showing my photographs. The dimension of a postcard is probably my favorite size as it fits very well the nature of my images which are taken in a very transient moment of passing by. As well I like stories or fragments of stories, narration is an important part of my work. The small size book is thus a perfect combination of this two preferences, that is the main reason why I like to use it as a tool of presentation for my work. In the same time a paperback book is a very mobile object, you can always carry it with you in your pocket if you want to – I like the idea to spread my images like this, in form of a paperback book. BABS: Can you expand upon the relationship between each page by Calvino and your photographs? DA: The relationship between Calvino’s textual city miniatures and my photographs of urban situations has rather the nature of a general analogy, of a specific way of looking at cities than being a page by page equivalent. I read Calvino’s descriptions of cities as metaphors of certain situations in life, of emotional conditions and dispositions. That way I can consider them to be verbal postcards, sent out from the ‚inner cities’ of somebody’s mind (e.g. of Marco Polo’s mind in the case of Calvino’s book). In a similar manner I conceive my photographs: although depicting physical and locatable places they represent as well a personal momentary state of mind – it’s the image side of the postcard from the ‚inner city’. I would thus consider my book as a visual adaption of Calvino’s book using it as a kind of template. It was never the idea to just illustrate it if not to add a visible layer to the invisible by trying to make the invisible visible. BABS: What significance does this book specifically have to your work? DA: The book provides a good insight into what can be considered the starting points of my work. It is a kind of compendium of the specific phenomena which especially and repeatedly attract my attention while strolling through the streets. 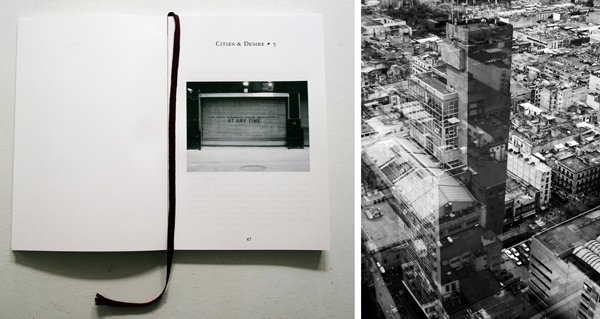 „In Visible Cities“ contains many photographs which I have never really used so far, which are pure visual notes and sketches and still await their potential further processing. Others in contrast already found their way into my work, passed through a process of alteration and turned from digital photographs into image objects. Somebody who knows my work a bit will thus quickly recognize several scenes and get an idea of the original photograph, the final result and the process of experimentation and transformation happening in between this two states. BABS: Are the chapter titles exact to the book structure? DA: Yes they are. I adopted all the titles as well as the table of contents from Calvino. It was a kind of play with the original book: while the chapter titles gave me hints and associations for defining my eleven photo series, the table of contents determined the final order of the images and thus the visual narration. Working on the book was a lot of fun, it gave me the perfect opportunity to get lost in my archive like I did before in the streets where I took all this photographs. And the same way I suddenly came across an interesting motif in a city I now rediscovered some already ‚forgotten’ images which I once took. So Calvino’s chapter titles, naming different ‚types’ of cities, animated me to look at and move through my image archive the same way as I do in cities: erratically and with the vagabonding gaze of a flaneur. BABS: Can you tell us about one of the chapters specifically – what is the relationship between Calvino’s words and the images you have selected? DA: The only words of the book which really influenced my choice of images where the titles announcing the respective category of city, such as “Cities & Memory”, “Cities & Desire” etc. They served me as a kind of keywords while going through my photo archive and I selected the images depending on what this keywords triggered in my mind. In doing so I didn’t took the titles literally if not more in a metaphorical way, so it is up to the reader which relation he/she establishes between the titles and the images, or which association comes to his/her mind while maybe reading the original story of Calvino and then looking at the image replacing this story in my book. The relationship is thus not very obvious and explainable but rather a subjective matter, it depends on the reader and his imagination. BABS: Many of your books take on a hand-made quality, can you say something about why you choose to make a some-what delicate object? In all of my works the haptic quality and materiality are very important. Although my photographs are taken with a digital camera they turn into analogue objects during my process of work, often unique and almost always quite fragile and delicate. A certain inherent weakness and vulnerability are central points of what my whole work is about and is reflected as well in its presentation. In the same way as I like the non-tourist and not so illuminated parts of a city I like the simple, original and handmade books and not the artificial big glossy volumes. All of my little artist books which I published so far in small editions are handmade by myself. 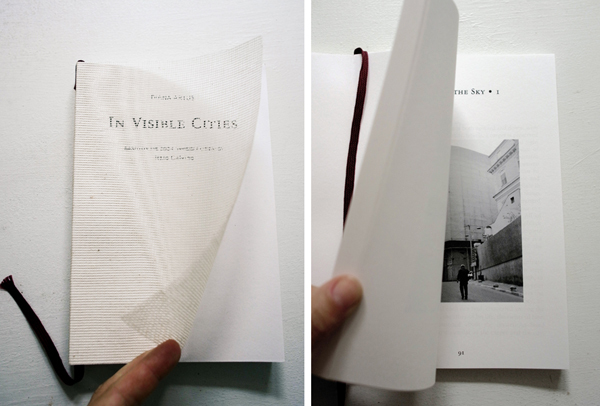 For “In Visible Cities” I choose an edition of 300, which I couldn’t do alone by myself, but it was very clear from the beginning that the book should keep the handmade quality of the first dummy I produced, especially the special mesh cover. I was thus very happy when my paths coincidentially crossed with the people from Plan Bey, which is a little gallery/bookstore/artist press project in Beirut. They produce everything what they are publishing and selling in their shops in Beirut and Berlin themselves, in a little team of 5-6 people. The final book now looks exactly like the dummy I made before!